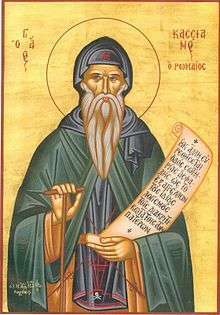 Saint John Cassian (c. 360 – 435 AD), John the Ascetic, or John Cassian the Roman (Latin: Joannes Eremita Cassianus, Joannus Cassianus, or Joannes Massiliensis), was a Christian monk and theologian celebrated in both the Western and Eastern Churches for his mystical writings. Cassian is noted for his role in bringing the ideas and practices of Christian monasticism to the early medieval West. Cassian was born around 360, most likely in the region of Scythia Minor (now Dobruja, a historical region shared today by Romania and Bulgaria), although some scholars assume a Gallic origin. The son of wealthy parents, he received a good education: his writings show the influence of Cicero and Persius. He was bilingual in Latin and Greek. Cassian mentions having a sister in the Institutes, whom he maintained a relationship with in his monastic life, she may have ended up with him in Marseilles. As a young adult he and an older friend, Germanus (with whom he would spend much of the next twenty-five years), traveled to Palestine, where they entered a hermitage near Bethlehem. After remaining in that community for about three years, they journeyed to the desert of Scete in Egypt, which was rent by Christian struggles. There they visited a number of monastic foundations. Approximately fifteen years later, about 399, Cassian and Germanus faced the Anthropomorphic controversy provoked in letter form by Theophilus, Archbishop of Alexandria. Cassian noted that the majority of the monks received the message of their patriarch “with bitterness,” and charged Theophilus with heresy for impugning the plain teaching of the Holy Scripture. Following an unsuccessful journey to Alexandria to protest the matter, Cassian and Germanus fled with about 300 other Origenist monks. Cassian and Germanus went to Constantinople, where they appealed to the Patriarch of Constantinople, Saint John Chrysostom, for protection. Cassian was ordained a deacon and was made a member of the clergy attached to the Patriarch while the struggles with the imperial family ensued. When the Patriarch was forced into exile from Constantinople in 404, the Latin-speaking Cassian was sent to Rome to plead his cause before Pope Innocent I.
Cassian's achievements and writings influenced St Benedict, who incorporated many of the principles into his monastic rule, and recommended to his own monks that they read the works of Cassian. Since Benedict's rule is still followed by Benedictine, Cistercian, and Trappist monks, John Cassian's thought still exercises influence over the spiritual lives of thousands of men and women in the Latin Church. Cassian died in 435 at Marseille. Cassian came very late into writing and did so only when a request was made by one or more important persons. His sources were the same as those of Evagrius Ponticus, but he added his own ideas, which were arranged in extensive collections. Evagrius was, however, the single most important influence on Cassian’s ideas, due to his reverence for the "Origenist" monks (who also relied predominantly on Evagrius) of Nitria, Kellia, and Scetis. Around 420, at the request of Bishop Castor of Aptia Julia in Gallia Narbonensis, Cassian wrote two major spiritual works, the "De institutis coenobiorum" (Institutes of the Coenobia) and the "Conlationes" or "Collationes patrum in scetica eremo" (Conferences of the Desert Fathers). In these, he codified and transmitted the wisdom of the Desert Fathers of Egypt. The Institutes deal with the external organization of monastic communities, while the Conferences deal with "the training of the inner man and the perfection of the heart." The Institutes were meant to help Castor to establish a coenobium following the model of Egypt, in contrast to the existing monastic life in Gaul, which included the work of Martin of Tours and Caesarius. According to Hugh Feiss OSB the Institutes are a counterweight to Sulpicius Severus’ Life of Martin and Dialogues, and are an attempt to put order into a movement Cassian regarded as chaotic. Cassian, who insists on manual work, had a higher opinion of and close ties with the monastery on the Island of Lerins, founded by Honoratus. In Books 1-4 of Institutions, Cassian discusses clothing, prayer and rules of monastic life. Books 5-12 are rules on morality, specifically addressing the eight vices - gluttony, lust, greed, hubris, wrath, envy, listlessness, and boasting - and what to do to cure these vices. In the Institutions, Cassian discusses a will that is more complex than the will at the heart of the Pelagian message. Willful monks are a contentious problem, and Cassian paid considerable attention to analyzing the will, treating the corrupt will, and chiefly subordinating even the good will for the good of the community and ultimately, the will of God. The Conferences, dedicated to Pope Leo, to the bishop of Frejus, and to the monk Helladius, summarize important conversations that Cassian had with elders from Scetis about principles of the spiritual and ascetic life. This book addresses specific problems of spiritual theology and the ascetic life. It was later read in Benedictine communities before a light meal, and from the Latin title, Collationes, comes the word collation in the sense of "light meal." His books were written in Latin, in a simple, direct style. They were swiftly translated into Greek, which indicates the Eastern monks recognized him as one of their own. The Desert ascetics of Egypt followed a three-step path to mysticism: Purgatio, Illuminatio, and Unitio. These stages correspond to the three ways of later Catholic theology. During the first level, Purgatio (in Greek, Catharsis), young monks struggled through prayer and ascetic practices to gain control of "the flesh"—specifically by purging their gluttony, lust and desire for possessions. This period of purgation, which often took many years, was intended to teach young monks that whatever strength they had to resist these desires (grace) came directly from the Holy Spirit. At this point, the Illuminatio (theoria in Greek) commenced. During this period the monks practiced the paths to holiness as revealed in the Gospel, identifying strongly with the Christ who taught the Sermon on the Mount (found in Matthew 5–7). Many monks took in visitors and students and tended the poor as much as their resources allowed. Many monks died never having moved past this period. 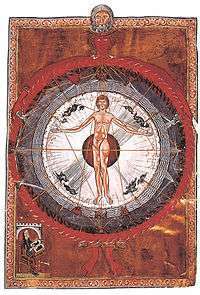 The final stage was the Unitio (theosis in Greek), a period in which the soul of the monk was meant to bond with the Spirit of God in a union often described as the marriage of the Song of Solomon (also called the "Song of Songs" or the "Canticle of Canticles"). To find the solitude and peace that this level of mystical awareness demanded, elderly monks often fled into the deep desert or into remote forests. His asceticism, while rigorous, was tempered by common sense. Cassian says hospitality should override ascetical routine. Even the most contemplative of anchorites should entertain visitors. Both asceticism and ministry are aspects of the practical life. Not without reason has this verse been selected out of the whole body of Scripture. For it takes up all the emotions that can be applied to human nature and with great correctness and accuracy it adjusts itself to every condition and every attack. It contains an invocation of God in the face of any crisis, the humility of a devout confession, the watchfulness of concern and of constant fear, a consciousness of one's own frailty, the assurance being heard, and confidence in a protection that is always present and at hand, for whoever calls unceasingly on his protector is sure that he is always present. It contains a burning love and charity, an awareness of traps, and a fear of enemies. Seeing oneself surrounded by these day and night, one confesses that one cannot be set free without the help of one's defender. This verse is an unassailable wall, an impenetrable breastplate, and a very strong shield for those who labour under the attack of demons. Saint Benedict praises Cassian's Conferences in his Rule and use of this formula became part of the Liturgy of the Hours in the Western Church, in which all the canonical hours, including the minor hours, start with this versicle, which is omitted only if the hour begins with the Invitatory, the introduction to the first hour said in the day, whether it be the Office of Readings or Morning Prayer. Saint Alphonsus Liguori also cites Cassian's recommendation to use this short prayer continually. For when God sees us inclined to will what is good, He meets, guides, and strengthens us: for “At the voice of thy cry, as soon as He shall hear, He will answer thee;” and: “Call upon Me,” He says, “in the day of tribulation and I will deliver thee, and thou shalt glorify Me.” And again, if He finds that we are unwilling or have grown cold, He stirs our hearts with salutary exhortations, by which a good will is either renewed or formed in us. Cassian finds the will to be insufficient for spiritual progress, and traces this back to the initial sin of pride. Cassian illustrates advanced cases of the will's pathology in the Institutions, saying these problems began when man "believed himself capable of attaining the glory of the Godhead by his freedom of will and hard work." To this end, Cassian believes the renunciate must conquer his will, overcome it, and even kill it. In regards to demons, Cassian noted that the earliest coenobites would ensure one monk was reciting a prayer, psalmody, or reading at all times, due to their belief that demons were especially prevalent at night. Cassian promotes David's evil spirit repulsing prayer at Ps. 35: 1-3, for demons actively oppose the virtuous life, and could be warded off with prayer. His third book, On the Incarnation of the Lord, was a defense of orthodox doctrine against the views of Nestorius, and was written at the request of the Archdeacon of Rome, later Pope Leo I. In this book Cassian points out a link between Nestorianism stressing the humanity of Jesus and Pelagianism which stresses human effort. Later theologians, however, labeled Cassian as “semi-pelagian” because he did stress the role of the human will, as against Augustine’s stress on the totality of grace, in moving towards salvation. According to the established traditional view among scholars, Cassian is the most prominent of the representatives of the monastic movement in southern Gaul who, in about 425, gave expression to the soteriological view that much later was called Semipelagianism. This emphasized the role of free will in that the first steps of salvation are in the power of the individual, without the need for divine grace. His thought has been described as a "middle way" between Pelagianism, which taught that the will alone was sufficient to live a sinless life, and the view of Augustine of Hippo, which emphasizes original sin and the absolute need for grace. For instance, Owen Chadwick stated that Cassian held that man can come to God without the intervention of divine grace first; and B.B. Warfield called Cassian the leader of the monastics in southern Gaul who asserted that men begin their turning to God and that God assists that beginning. The ideas expressed by Cassian to which critics have pointed as examples of his alleged Semipelagianism are found in his Conferences, in book 3, the Conference of Abbot Paphnutius; book 5, the Conference of Abbot Serapion; and most especially in book 13, the Third Conference of Abbot Chaeremon. The view that Cassian propounded Semipelagianism has been disputed. Lauren Pristas, writes: "For Cassian, salvation is, from beginning to end, the effect of God's grace. It is fully divine. Salvation, however, is salvation of a rational creature who has sinned through free choice. Therefore, salvation necessarily includes both free human consent in grace and the gradual rehabilitation in grace of the faculty of free choice. Thus Cassian insists salvation is also fully human. His thought, however, is not Semi-Pelagian, nor do readers who submit to the whole corpus emerge Semi-Pelagians." And Augustine Casiday states that "for Cassian ... although sparks of goodwill may exist (which are not directly caused by God), they are totally inadequate and only direct divine intervention can ensure our spiritual progress". The Latin Church condemned Semipelagianism in the local Council of Orange (529), but recognizes Cassian himself as a saint. It did not endorse Augustine entirely and, while later Catholic theologians accepted Augustine's authority, they interpreted his views in the light of writers such as Cassian. Augustine Casiday states that Cassian "baldly asserts that God's grace, not human free will, is responsible for 'everything which pertains to salvation' - even faith." Some other Orthodox, who do not apply the term "Semi-Pelagian" to their theology, criticize the Roman Catholics for allegedly rejecting Cassian, whom they accept as fully orthodox, and for holding, as, in Casiday's interpretation, that everything which pertains to salvation comes from God's grace, and so that even the human consent to God's justifying action is itself an effect of grace, This position of the Roman Catholic Church and of Cassian as interpreted by Casiday is attributed by Eastern Orthodox theologian Georges Florovsky also to the Eastern Orthodox Church, which, he says, "always understood that God initiates, accompanies, and completes everything in the process of salvation", rejecting instead the Calvinist idea of irresistible grace. Neither Cassian nor any of his teachings have ever been directly or indirectly called into question or condemned by Eastern Orthodox, as they are considered a witness to the Orthodox position. The spiritual traditions of Cassian had an immeasurable effect on Western Europe. Many different western spiritualities, from that of Saint Benedict to that of Saint Ignatius of Loyola, owe their basic ideas to Cassian. Gregory the Great’s teaching on the seven deadly sins comes from Cassian, as does much of his teaching on compunction and prayer. St Philip Neri used to read Cassian to the laity and would frequently use his work as the starting point for his own addresses. He also influenced John Climacus and John of Damascus, as well as St Dominic, St Francis de Sales and Cardinal Newman. Cassian’s writings stress the role of prayer and personal asceticism in attaining salvation by contrast with St Augustine’s writings which stress the role of God’s justice and grace (predestination) and take a more negative view of human effort. His teaching on overcoming the eight evil tendencies (See Books 5 to 12 of The Institutes) were the inspiration behind the way the Irish monks practised asceticism, as shown in the Irish Penitentials. The Institutes had a direct influence on organization of monasteries described in the Rule of St. Benedict; Benedict also recommended that ordered selections of the Conferences be read to monks under his Rule. Moreover, the monastic institutions Cassian inspired kept learning and culture alive during the Early Middle Ages, and were often the only institutions that cared for the sick and poor. His works are excerpted in the Philokalia (Greek for "love of the beautiful"), the Eastern Orthodox compendium on mystical Christian prayer. Even modern thinkers are beholden to Cassian's thinking. Michel Foucault was fascinated by the rigorous way Cassian defined and struggled against the "flesh". Perhaps because of investigations like these, Cassian's thought and writings are enjoying a recent popularity even in non-religious circles. Abbey of Saint Victor, Marseille, where his relics are placed. He is a saint of the Eastern Orthodox Churches, with a feast day on 29 February, a date assigned also in the liturgical calendar of the Episcopal Church (USA). Because this day occurs only once every four years on leap years, official Church calendars often transfer his feast to another date (usually 28 February). The Roman Catholic Church also ranks him as a saint, with a feast day on 23 July. Like his contemporaries Saint Augustine of Hippo and Saint John Chrysostom, he was never formally canonized, a process that came into use several centuries after his death. Pope Urban V referred to him as sanctus (a saint) and he was included in the Gallican Martyrology He is included also in the Roman Martyrology with a feast-day on 23 July. Like the great majority of recognized saints of the Church, he is not one of the saints in the General Roman Calendar, but the Archdiocese of Marseilles and some monastic orders celebrate his memorial on his feast day. Cassian's relics are kept in an underground chapel in the Monastery of St Victor in Marseilles. His head and right hand are in the main church there. ↑ "John Cassian". Christian Classics Ethereal Library. Retrieved 5 April 2016. ↑ Stewart, Columba (1998). Cassian the Monk. New York Oxford: Oxford University Press. p. 4. ISBN 0-19-511366-7. ↑ Shepherd, Jr., Massey Hamilton (Sep 1938). "The Anthropomorphic Controversy in the Time of Theophilus of Alexandria". Church History. JSTOR 3160566. ↑ Driver, Steven D (2002). John Cassian and the Reading of Egyptian Monastic Culture. Routledge: Routledge. p. 4. ISBN 978-0415936682. ↑ A. M. C., Casiday (2007). Tradition and Theology in St. John Cassian. New York: Oxford University Press. p. 96. ISBN 978-0-19-929718-4. ↑ John Anthony, McGuckin (2011). The Encyclopedia of Eastern Orthodox Christianity. Indiana University: Wiley-Blackwell. p. 533. ISBN 978-1-4051-8539-4. ↑ Schaff, Philip (2009). Nicean and Post-Nicean Fathers Series Two Volume Eleven. Sulpitius Severus, Vincent of Lerins, John Cassian. Grand Rapids, Michigan: Christian Classics Ethereal Library. p. 428. ↑ Casiday, A. M. C. (2007). Tradition an Theology in St. John Cassian. New York: Oxford University Press. p. 97. ISBN 978-0-19-929-718-4. ↑ Casiday, A. M. C. (2007). Tradition and Theology in St. John Cassian. New York: Oxford University Press. pp. 172–173. ISBN 978-0-19-929718-4. ↑ “When Catholics say that persons cooperate in preparing for an accepting justification by consenting to God’s justifying action, they see such personal consent as itself an effect of grace, not as an action arising from innate human abilities"
↑ Augustine's writings found their way to parts of the West Roman provinces. St. John Cassian (circa 360-433), former ascetic in the deserts of Egypt and then deacon of the Patriarch of Constantinople St. John Chrysostom, challenged Augustine's teaching about original sin and pre-destination without mentioning him. The teachings of Augustine on these points were condemned by the Council of Orange in 529. [ 18 ] Augustine's writings completely captured the 8th century Carolingian tradition which knew basically only Augustine until the 12th century. At that time the Franks acquired a translation of St. John of Damascus' "Book on the Orthodox Faith" which they simply understood within their own Augustinian categories. By the 11th century the Franks had taken over all of Western Europe, except Spain, by either conquest or diplomacy. The Spanish Romans under Arab rule were still under the direct surveillance of the Roman Emperor of Constantinople New Rome. The Umayad Arabs of Spain and the Abbasid Arabs of Damascus and then Baghdad called their Roman Orthodox subjects Melkites, i.e. those who belong to the religion of the Roman Emperor in New Rome Constantinople.